Why the Nollywood actress said she was rejected by her father. 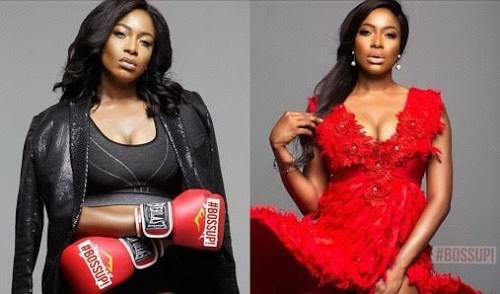 Chika Ike recently released a book titled 'Boss Up,' and has unveiled what motivated her to release the 41-chapter book that covers all the obstacles people go through in life, like money, self-esteem, fear, also relationship. "I WAS REJECTED FROM BIRTH BY MY FATHER BECAUSE HE DIDN’T WANT A GIRL. SO, IT (THAT SECTION) TALKS ABOUT ME, MY CHALLENGES GROWING UP AND THE REJECTION I FACED FROM MY FAMILY. THE BOOK ALSO TALKS ABOUT THE BUSINESS WORLD BECAUSE PEOPLE THINK I LIKE MONEY. WELL, THEY MAY BE RIGHT BECAUSE I GREW UP WITH NOTHING AND DON’T WANT TO BE A FAILURE AND I ALWAYS PUSH MYSELF TO SUCCEED. I WANT TO CHALLENGE MYSELF TO BE SOMEBODY PEOPLE THOUGHT I CAN NEVER BE. "WHEN I WAS IN HARVARD BUSINESS SCHOOL, THE FIRST TWO WEEKS WAS ABOUT PERSONAL CASE STUDIES AND PERSONAL DEVELOPMENT. I WAS GIVEN A COACH AND I WAS LIKE I DIDN’T COME HERE TO TALK ABOUT MY FAMILY AND MY LIFE. BUT THE SCHOOL AUTHORITY REALIZES THAT BEFORE YOU CAN BE SUCCESSFUL IN YOUR BUSINESS YOU MUST DEAL WITH THE HOME FRONT FIRST. EVERY SUCCESSFUL MAN AND WOMAN YOU SEE OUT THERE HAS SUCCEEDED IN THEIR FAMILIES. THEY GAVE ME A PERSONAL COACH WHO WENT DEEP INTO MY PERSONAL LIFE: MY FAMILY, MY UPBRINGING AND ME. I WAS SOMEONE WHO WAS BROUGHT UP GUIDED BUT HARVARD BUSINESS SCHOOL UNGUIDED ME. THEY MADE ME STAND IN FRONT OF OVER 200 PROFESSIONALS TO TALK ABOUT MY LIFE. I SPOKE SO MUCH ABOUT MY LIFE, FAMILY AND HOW I WAS REJECTED BY MY FATHER WHO WAS A GOOD HUSBAND AND FATHER TO ALL HIS CHILDREN. BUT I DIDN’T HAVE A GOOD RELATIONSHIP WITH HIM GROWING UP. I LEARNT EARLY THAT YOU HAVE TO FIGHT FOR YOURSELF BECAUSE AT THE END OF THE DAY IT IS YOU ALONE. I TALKED ABOUT MY FATHER, MY MOTHER AND MY SIBLINGS."